“Phantom Presence” consists of photographs of people, manmade objects, and altered nature—insects, animals, and interior histories that point to a continuum of humanity through what first appear to be small gestures. The photographs exist as observations of particular moments that in some way convey a sense of absence or emptiness. Shifting from the superficially casual gesture of a digital point-and-shoot to the meticulous detail of an 8 × 10 view camera, the imagery vacillates between the appearance of staged artifice and that of a real document. Sharing melancholy, empathy, and, perhaps, a longing for human warmth, the photographers included in this exhibition seek out things that have inherent in them a passing or a miniature death. Such intrinsic losses are, however, combined with a sense of optimism, as each photographer considers how a compassionate, potentially healing gesture might look. The photographs in the show serve as witnesses to something in which people play a part, whether through a shared experience, a baby, a purebred dog, a conserved Shaker attic, a honeybee, a blind bird, or two empty park benches placed in conversation with each other. “Phantom Presence” initially grew around a photograph of mine called Strawberry Field, Imagine Memorial, 2008. 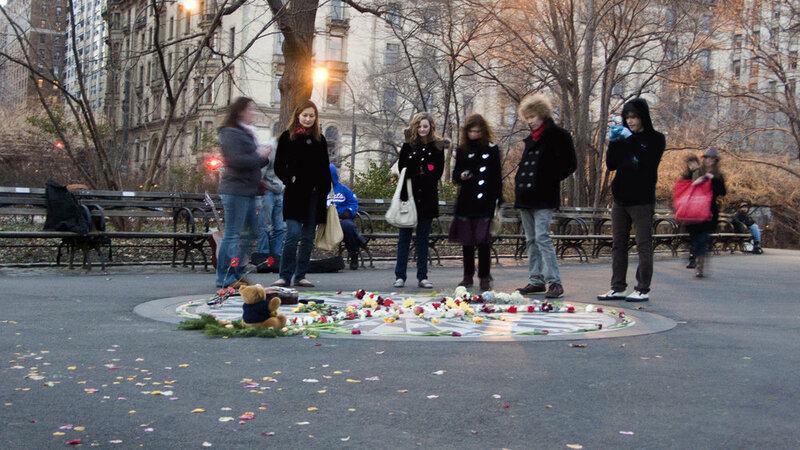 The photograph shows a scene of young, seemingly contemplative men and women, dressed in winter attire and looking down at the Imagine Memorial on the ground before them. One can sense a longing for, or mystification of, John Lennon’s life in the expressions of these young people, a life that most likely ended before they were born. The composition of the photograph recalls the cover of the Beatles’ 1967 album Sgt. Pepper’s Lonely Hearts Club Band. Absent here, though, are the color, pomp, and celebration of the album cover: the time of day has shifted to dusk, and the crowd of people lined up has dissipated. The circle of the Imagine Memorial holds the same location as the circle of the drum on the cover, which reads “SGT PEPPERS LONELY HEARTS CLUB BAND.” The flowers spelling the Beatles name are represented in the photograph by a scattering of petals and carnations on asphalt and on the memorial itself. The album jacket is constructed and posed; the photograph is a fortuitous moment. The photograph was taken with a small digital camera and enlarged to 30 by 60 inches in order to force the details of the image to fall apart, almost romantically, becoming soft, mirroring the light and time of day in the same way that softening can happen to a person’s sight. In the background is a reflection of the sun setting on the Dakota apartment tower, where John Lennon was famously murdered. The longing for a voice that called for peace and died violently seems shared by the photographer and the figures looking at the subject of the photograph—whether a physical memorial or a tribute to peace. As a photograph of dichotomies, Strawberry Field, Imagine Memorial, 2008 introduces a series of speculations about the reading of a set of disparate images—images that, in “Phantom Presence” come together in their potential humanity, in the presence of compassion, and in the absence of that which is desired. Renée Martin’s photographs document wild birds with disabilities—birds that would be dead without the care of animal lovers. Natalie Shriver’s photographs, portraits of purebred pug dogs reared by her grandmother, posed and taken in her grandmother’s home, raise intriguing questions of domestic family dynamics. Senna Chen’s Kite Day, a diptych comprising one photograph of a kite in the sky and one of a young man gazing upward, examines the nature of love and desire. Amanda Alfieri’s photograph visually interprets an episode of personal history taken from a stranger’s diary, using documentary-style staging to speak about issues of desire and personal suppression—or perhaps oppression. Joey Lehman Morris’s photographs vary in subject matter from a second-floor door leading to a two-story drop, to a nighttime desert landscape with a black sky and a strangely illuminated ground, to two empty park benches facing one another, as if in conversation. Each of Morris’s photographs serves as a reminder of the kinds of paradoxes in which the reality of existence becomes a newly curious phenomenon. Four of the artists included in “Phantom Presence,” Renée Martin, Joey Morris, Amanda Alferi, and Senna Chen, have been awarded the Handtmann Photography Prize while studying at the USC Roski School of Fine Arts. The Handtmann Photography Prize, awarded to an undergraduate student at the end of his or her third year to produce an exhibition during the coming year, is the only award of its kind in the United States. It has been my great pleasure to serve as faculty advisor to each of the students who has won the Handtmann Prize. I am fortunate to have worked so closely with such intelligent and thoughtful artists and to have formed lasting friendships with former students who share overlapping photographic concerns. “Phantom Presence” offers a meditation on the intricacies of the condition of being present or “being.”(I’d cut ‘or “being”’ –it is used later in the paragraph) Through photography, a medium often associated with the archival and the visual representation of individual and collective memory, “Phantom Presence” pushes beyond the simple relational dynamics of the viewer and the still image. Julia Paull’s photographs of a sleeping child, a solemn memorial, wildlife, and remnant architectural furniture autonomously evoke either the physical presence of another or a palpable recognition of another’s existence in a specific place in time. These images, juxtaposed with alumni and student work that awaken an interrogation of being, are installed in varying configurations, avoiding narrative structure and giving each work an individual voice. This installation allows for a dialogue between the viewer and each work; a conversation between two beings renegotiating memory, time, and their individual existence. The photograph has always attempted to fix things that are inherently transitory: to preserve a world—a thing, a space, or a moment—on the verge of modification, obsolescence, or disappearance. However, a photograph can only prolong a very small and very altered variant of such things that it wishes to fix and preserve.